Summary : This was the best pizza I had in Argentina. El Cuartito has an old school vibe and is frequented by locals. Make sure you try their fugazetta pizza. I recently spent a week in Argentina — the land of steak (carne asado! ), wine (vino! ), and pizza (yes… pizza!). Until I started researching pizza prior to my trip, I never imagined that it would be such a big deal there. I’d previously been to Brazil and Colombia and I had very uninspiring pizza experiences in both places. One article I read about pizza in Argentina claimed that there was a pizza place on nearly every block. Wrong! There were literally five places on every block. I felt like it was impossible to be standing on any street in Buenos Aires without being able to locate multiple pizza places. It might be a bit of an exaggeration, but in terms of pizza places per capita, I have no doubt that Buenos Aires would beat any other city in the world. But as any pizza lover knows… it’s about quality, not quanity. I visited four pizza places during my trip: El Cuartito (Talcahuano 937), Banchero (Corrientes 1300), Las Cuartetas (Corrientes 838), and El Palacio De La Pizza (Corrientes 751). Each came highly reviewed and there were a dozen more places on my list that I wasn’t able to make it to (hey, a man needs to leave room for some steak!). Each place had similarities but the quality of the pizza and my experience at each place differed greatly. All four places are located within a short walk of one another — Google Maps says you can hit up all of them in a total of 17 minutes, but of course they don’t factor in TFPE (that’s Time For Pizza Eating!). Despite their proximity, I spread out my pizza eating over the course of four days as not to overload. Most of the places I didn’t make it to were located farther from the city center, but given the short amount of time I was there, I decided to focus on the more centrally located establishments. My first foray into the world of Buenos Aires pizza was El Cuartito, which also happened to be my favorite place. The moment I walked in through the door I could feel the energy of the pizzeria. It was packed around noon on Saturday and the place looked like it hadn’t been renovated in years. It wasn’t dirty or grungy, but I could envision the atmosphere being the same when it opened in 1934. Some of the decorations made sense to me (Argentinian soccer uniform) while others did not (Mike Tyson Vs. Frank Bruno boxing poster). 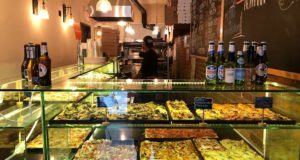 Often times when new pizza places open in New York or elsewhere they try to create an old school retro vibe — the kind of vibe you’d imagine your ancestores might have encountered had they stumbled upon some hole in the wall pizza place in a small town in Italy. El Cuartito felt truly authentic. It’s the real deal — the kind of place that might serve as a model for what a pizza place should look like. Each pizza place I visited was essentially divided into two areas: a sit down area with tables and waiter service (above) and an area near the counter where you can order slices, gobble them down while standing up, and hit the road (below). It’s rare to find a place in NYC where you have the options of sitting down or ordering a slice and eating it at the restaurant, but that’s the standard practice down in Buenos Aires. Because of time constraints and the fact that I was often eating alone, I decided to partake in the “stand up” option at each place. Despite a slight language barrier (umm, pizza por favor?) the service here was friendlier than anywhere else. You could tell the people were truly happy to be working there and were more than willing to put up with my subpar Spanish. While there were other tourists there, the majority of the people were locals. More than any other place, El Cuartito has begun to work it’s way into guidebooks and blogs (yes, it’s true), and I wouldn’t be surprised if it continues to see a growing influx of tourists in coming years.Nevertheless, when the people behind the counter saw me taking photographs, rather than giving me the evil eye as staff at some places did, they encouraged me to shoot away, even posing for photos (see below). After I placed my order, I took out my wallet and they told me to pay after I was done eating. This was juxtaposed with the service at other places at which I had to pay for my pizza upon ordering and bring my receipt to someone else who would then put in my order. So by now you’re probably wondering about the actual pizza. The real highlight for me throughout my trip was the fugazetta pizza and nobody did it better than El Cuartito. Buenos Aires is known for it’s fugazetta pizza which contains double cream cheese, mozzarella, onion and olive oil. 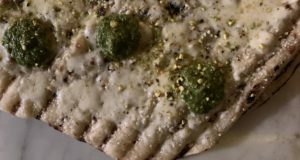 It’s also known for it’s similar tasting fugazza pizza which contains onion, grated parmesan cheese and onion. Onion happens to be one of my favorite toppings, so I was particularly excited to try these concoctions. You can click on the menus below (full Spanish on the right, English descriptions on the left) to get a sense of typical types of pizzas served in Buenos Aires. In addition to ordering a slice of fugazetta (below, top), I also ordering a slice of mozzarella (below, bottom) . The mozzarella slice was very standard. Definitely not worth trekking over to El Cuartito to try, but it did serve as a nice compliment to the pizzeria’s true gem: the fugazetta slice. The slice was thick, yet still held together well, unlike at other places. The cheese was flavorful and quite gooey and the onions brough out the flavor in every bite, although they didn’t overwhelm the slice. The ingredients were distributed well so that every bite was treated equally. It certainly wasn’t thin crust, but it wasn’t deep dish either. It was some weird combination which I was exposed to for the first time at El Cuartito… and I was impressed. 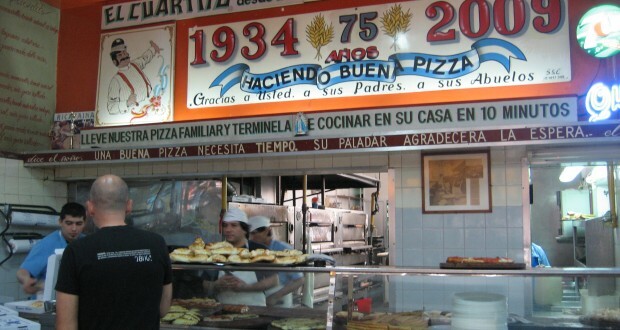 If you have time to go to only one pizza place in Buenos Aires — make it El Cuartito. 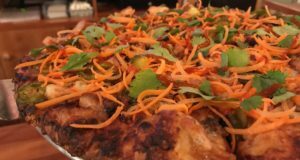 Great vibe, great atmosphere, great service, and most importantly… great pizza! Previous: How About Some Turkey Pizza?